In tribute to one of the greatest Western Space shows….one of the only Western Space….THE ONLY Western Space show in existence, I would like to make a blog entry entirely on why I love Firefly so much. Starting with the introduction of the crew. Ahem…. Firefly is one of the only shows that I know of that combines the life of the old, with the life of the “to be” or “could be.” It integrates the futuristic, glossy space aspects of life with the rustic, dusty, and wild ways of the western posse. Malcom “Mal” Reynolds, the captain of Serenity–a Firefly class ship–and captain of eight others. Mal, I feel, has a deep inbred sense of dignity and integrity, although he may not show it 100% of the time, it peeks in and out throughout the show. Zoe, the ships wartime heroine and old time war buddy of Mal, is very knowledgeable in the ways things are done around the ship. 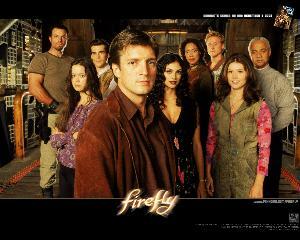 The Firefly deals with a multitude of illegal activities and Zoe is Mal’s wingman in making them happen. She is also married to Wash, the ships pilot. Inara is a companion, although Mal likes to call her other things. Basically, she gives the ship respect on their less than respectable missions. Being a companion entails that she finds clients to have a very sensual experience with. She attended an academy to be a companion and being one holds a sort of respectableness about the whole thing, or something or rather. She has a love interest in Mal, and it is very obvious to the audience, but Mal doesn’t give it a chance. He is equally interested, but doesn’t have what it takes to go any further. It’s all very annoying to the viewers. Ahh, to one of my favorites, Jane Cobb. Jane is a very, very dense man. Sometimes it takes a few punches before he realizes that he is feeling pain. Okay I exaggerate…kinda. Jane is a weapons and tactics specialist. It’s what he does. You want him in a firefight, but what you don’t want is him on the other side. Mal finds this out in a few close calls in a few episodes. Jane will do almost anything if the money is right. What I love so much about Jane is the way he is. I can’t say it any more simple than that. He says some of the funniest things sometimes and he doesn’t even mean to. Kaylee, the ships mechanic. She is a quirky, joyful, girl who looks like she should be back at home rather than manning a Firefly class ship. Her attitude sparks up the entire crew. It is sometimes because of her that things are kept at an even level. She has a love interest in the ships medic, Simon. I think that Kaylee’s presence on the ship goes against what her position should be filled with, which is usually a sweaty, manly man, with a beard of some kind. Joss Wedons breaking of the stereotypes in this series is just refreshing at its minimal. Simon, the ships Doctor. He is a fugitive on the run with his sister, River. The government was messing with Rivers mind and Simon ran in to save her. He is a rich boy at heart, top 3% of his class, and very proper. He mutually likes Kaylee, only difference with Simon and Mal is that Simon and Kaylee both know they like each other. Jane and Simon have an ongoing feud that has been festering since day one. Jane has had it out for the Doc ever since he knew he was a fugitive. River…well…River is Simon’s little sister and she is completely insane–or at least thats how Jane would put it. Actually, Jane would say something more close to, “She’s out of her ruttin’ mind!” River is gifted in anything that she does and more so. Everything comes naturally to her. Unfortunately, she bursts out in emotion every time she “feels.” Every emotion is exaggerated, and sometimes she acts very rashly and very unpredictably. River is left as a mystery, which drives viewers nuts, but I think its best kept that way. The Shepherd or Preacher is the ships designated man of God. He sometimes feels useless, but slowly his skills show through in the series. Everything from cooking to knowing what type of gun shoots from 1000 meters. He is the biggest mystery, I think, and would like to have known more about him before the series came to a close. I especially would like to know how he was granted medical treatment by Alliance without a whim. Okay, you may now call me a geek. Thus ends the ships crew. A multitude of characters, full of secrets, strengths, and…well…character. Joss Whedon (creator) does more than a fine job of creating a crew that everyone can love. You can’t help but get sucked into the internal drama going on within each and everyone of the people on board. To top it off, Joss integrates great score and comedy into the mix. The comedy throws in a whole bliss about the entire show that offsets the seriousness that more than likely will poke its head somewhere in the episode. As a personal opinion, I would have to say that my most favortest of moments (I am even talking like the show, ha) would have to be in the episode The Message, when they are burying their long lost war friend. The music that is played at that particular moment is just so real, and genuinely heart wrenching that I can’t help but tip my hat to the brilliance achieved by Joss Whedon. Well done. I never tire watching it over and over. Because something that is made as masterful as this show is more than a show, it’s art. So, the time has come for another edition of me writing and you reading. I haven’t been on in a while because I have been at a camp counseling kids at Springhill Camps. The time there was great. I can’t go into everything that happened because that would take over an hour, ha, but I can say that it was impossible to deny the movement of god in that place. He was in everything and working in everyone. It was more than a blessing to see God handcrafting these kids everyday. At times it was hard to keep it going when the kids were less than responsive to the different kinds of messages God was trying to get into them, but through prayer and the prayer given to me by some of you, I was able to do more than I thought I was capable of. I will be heading back to school in about a week, but it will be a new school, filled with new people and new opportunities. It is exciting, and exciting is good right now. I will be moving and extra 10-20 minutes west to live. I will be commuting to school by bike and everything…pretty much…is going to be new. It is not going to be easy to start out with, but I have been fine in these situations before–I just can’t forget that I need God.